The French government signalled Wednesday that it was prepared to make further concessionsto “yellow vest” protesters, even raising a possible rollback on a controversial move to cut taxes for high earners last year. 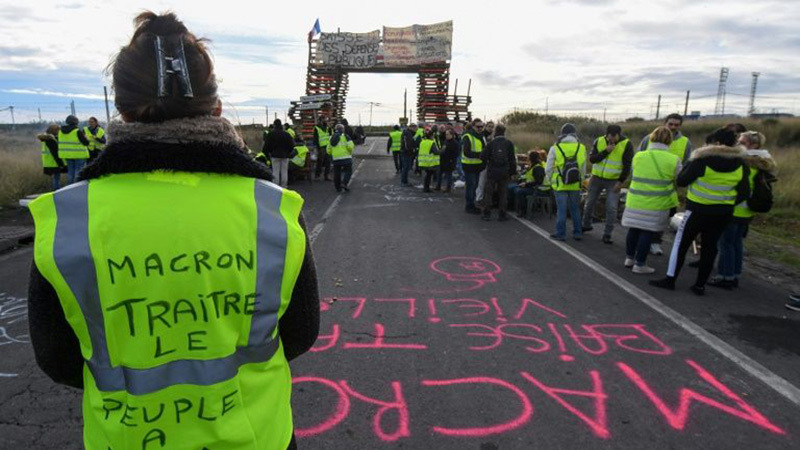 The so-called “yellow vest” protests began on November 17 in opposition to rising fuel taxes, but they have since ballooned into a broad challenge to Macron’s pro-business agenda. “If something isn’t working, we’re not dumb, we’ll change it,” government spokesman Benjamin Griveaux said on RTL radio on Wednesday morning, saying the wealth tax would be evaluated between now and late next year. Griveaux stressed that re-instating the ISF “is not on the table for now,” but Equality Minister Marlene Schiappa said she would argue to bring it back unless the tax cut could be shown to be effective. “The government has been too technocratic and took too long to respond” to the protests, she told France 3 television Tuesday in a withering assessment of the management of the current political crisis. On Tuesday, Prime Minister Edouard Philippe announced the first major U-turn of Macron’s presidency when he suspended for six months a rise in fuel taxes scheduled for January 1. “We’re not in politics to be right. We’re in politics so that things work out,” he said. A source in the prime minister’s office also told AFP that “the government has not necessarily played all of its cards”, with further concessions such as a further cut in residence taxes possible. Many “yellow vest” protesters, named after the high-visibility jackets they wear, have said that Philippe’s rollback on fuel taxes is not enough and have called for new protests in the capital on Saturday. Interior Minister Christophe Castaner on Tuesday urged “responsible” protesters not to come to the capital after crowds ran amok last Saturday, burning more than 200 cars, vandalising shops and leaving the Arc de Triomphe daubed in graffiti. Opposition leaders, including Laurent Wauquiez of the rightwing Republicans, have called on the government to impose a state of emergency and to deploy army units to back up police. Amid his domestic woes, Macron also saw his “friend” US President Donald Trump weigh in on Twitter, saying protesters were disavowing Macron’s adherence to the 2015 Paris climate accord. “The Paris Agreement is fatally flawed because it raises the price of energy for responsible countries while whitewashing some of the worst polluters… in the world,” Trump wrote. Macron’s office said it had “no comment” on Trump’s tweets.